Whilst I haven't shared content here on Reading With Jade in over a week, I have been reading in that time - happily so! I will admit though that my reading is a bit all over the show at the moment. I'm trying to work on getting back to focusing on just the one book at a time, and am hoping to start tracking my reading a bit more thoroughly with a reading record for the remainder of this month. 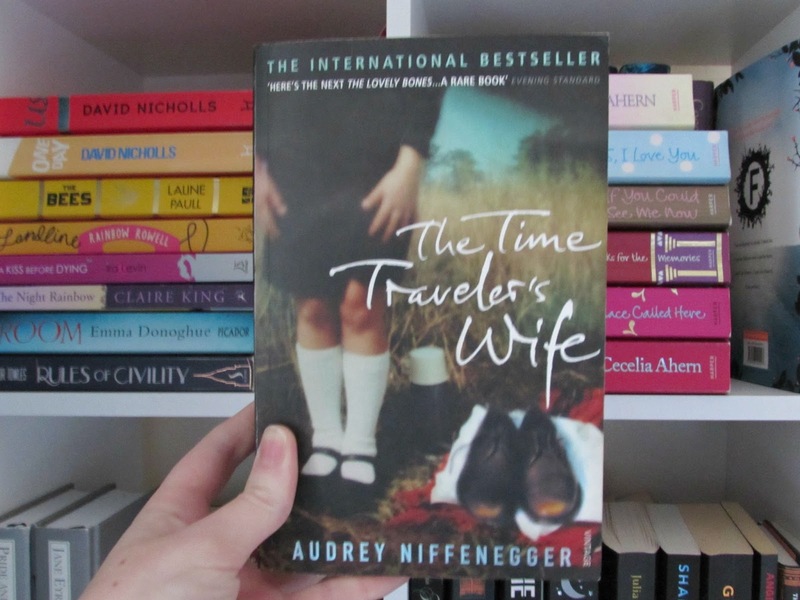 As the picture above shows, my current main read is The Time Traveler's Wife by Audrey Niffenegger - this is my reread for the month of February. In case you didn't know, I've assigned myself a reread title for each month of the year, and you can read the full list here. Alongside this book I'm also reading an e-book and dipping in and out of a non fiction title too. On my Kindle I'm currently breezing through Behind Closed Doors by B.A. Paris - I'd heard a lot of positive things about this title, and being over half way through the book, I can see why! Such a page turner! I'm also reading all about the KonMari method at the moment, having picked up The Life-Changing Magic of Tidying from the library. I feel like I'm probably one of the last people to pick up this book, and whilst I know I wouldn't fully implement the method into my own life, I'm finding the theory really insightful and it is giving me that push I need right now. Good luck on your re-reading challenge. Good picks this week. Happy Reading! "The Life-Chaging Magic of Tidying" is wonderful - I really love her encouragement to keep items that bring joy... it's such a nicer way to look at knick-knacks around the house. I hope you enjoy her philosophy! I'm definitely enjoying learning about the KonMari method - there are a few things that make me raise my eyebrows, but overall, an interesting philosophy. Loved The Time Traveler's Wife when I read it years ago and now remember almost nothing about it...except that I loved it. You'll have to let me know how it holds up. I'm having very much that experience... I'm finding that I still absolutely love the story! Read over half of The Time Traveler's Wife at a busy time. Would like to go back and pick up Harry and...Like your idea about rereading one a month. Haha! Henry and Clare. I find The Time Traveler's Wife to be the kind of book that needs a good amount of dedication in order to absorb and appreciate the story. I'd recommend going back! I loved TTTW! Enjoy your re-read. I really enjoyed Behind Closed Doors...I'm reading her second book right now and it's good! Thanks - I'm loving my re-read. Behind Closed Doors just gets more and more twisted the further I read, but such a well written book. I see why you're reading more books by her! I absolutely love The Time Traveler's Wife! What a great pick for a reread. I also found Behind Closed Doors a fun fast read and am hoping to get to Paris's new book, The Breakdown, soon. Thanks for the reminder about The Life-Changing Magic of Tidying Up. I just put a hold for it at the library. I could benefit from reading that, too. So I'm not the only one left. Haha! Whilst some of the methods are a little out there for me, I've found The Life-Changing Magic of Tidying has really motivated me to get sorting. I hope you enjoy when it comes in. I like the idea of assigning a book to reread each month. I have a stack of books I'd like to revisit. Ah, you should give it ago! I love rereading, but often find I don't make the time for it with so many other books, and assigning one reread a month is pretty manageable. I’m also trying to reread a book a month. I’m starting with the Harry Potter series. I read The Time Travelers Wife a few years ago and really liked it. Enjoy your reads! What better place to start with rereading than Harry Potter! I reread the books at the end of last year, and am now slowing making my way through rewatching the movies. I hope you're enjoying your reread. Have a great week - bookish and otherwise. I love a good time travel story and have heard that that book is really good (and I think there was a movie)? This was one of my first introductions to time travel, and whilst it took me a while to wrap my head around it, I absolutely fell in love with the story. There is a movie adaptation, yes. It wasn't as good as the book, in my opinion. Great idea to make a reread for each month, good way to ensure it happens! Thanks - it is proving to be a really manageable way of getting rereads in whilst maintaining a balance with other titles also. Have a great week! I had mixed feelings about The Life Changing Magic of Tidying Up. Part of it felt like it just didn't translate well for the typical American house and lifestyle and her attitude about books was nightmare inducing. I did love how she suggested to fold clothes to go in drawers. It made life way better in that area! I love the idea of a reread month! I definitely get your viewpoints on The Life-Changing Magic of Tidying - I had a moan to my partner about the book section! Have a great week, reading and otherwise. My issue with The Life-Changing Magic of Tidying Up is I do not live alone. I can follow the methods happily, but if the other people in the house don't... It gets you no where. So, while it did inspire me to purge things when I read it, it just is not realistic for my household. I totally understand that as I'm in a similar boat myself. I know she touched upon that subject in the book, but I feel like she glazed over it at the same time. I have found it to be a motivating read however. I've been wanting to read some of those newfangled books about cleaning and getting rid of things. I have way too much stuff, I think. Lol. Oh my gosh - Behind Closed Doors started to really freak me out. I actually ended up skipping the middle and just reading the end! I know, I am a weirdo! I couldn't get through the tense parts, but I still wanted to know how it ended. Haha! I feel like I've got quite good with having fewer belongings and such in the past couple of years, and I've already found myself getting rid of more things and working on organisation since picking up The Life-Changing Magic of Tidying; I'd recommend giving books of the nature a read! Yes! I've just passed some pretty twisted and tense scenes! I totally get why you skipped ahead. I've been reading it in little bouts, because I can't take the darkness of it all in the one go! What a great picture that is of fresh spines lining a clean bookcase. Rereads are so comforting and a smile, yeah?